This machine vibrates in high frequency and low amplitude, provides you with a new and exciting way to train!. Remote Control & Resistance Bands. 4 suction cups affixes unit to floor. LED display shows time, speed and burnt fat. 5.5" height & ultra-thin design for portability and easy storage. Improve balance, bone density, muscle strength, and circulation. Various workout styles like whole-body exercise, squat posture, lower legs posture, groveling posture etc. Activate entire body, relieve tiredness, increase bone mineral density, enhance metabolism, increase blood circulation etc. Pregnant women and seniors should not use this item too frequently. Don not use this machine within two hours after meal. Do not stomp on the plate. ※ Whole-Body Vibration:Try different styles by lifting weights or squats on the board to improve results. 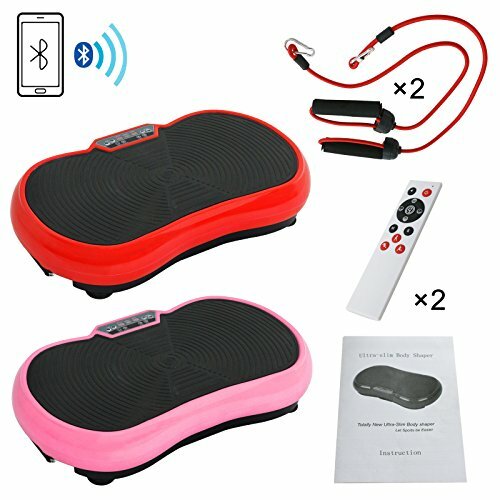 Adjustable vibration speed (1 to 99, with 99 having the maximum intensity) to suit different needs, remote easily controls the speed at the click of a button,and 10 minutes on this vibration platform equals 1 hour of jogging,forcing the muscles to contract and relax dozens of times a second. It is estimated that a dozen exercises are completed in one minute. ※ Thoughtful Design:ABS shell for durability and sturdiness, ergonomic design, anti-static and anti-overload device, load capacity up to 300 lbs,LED display to show time, speed and fat at the same time.Small compact size - can be used anywhere at home & easy to put away.Comes with Arm cords, Remote control ,Resistance Bands and Instruction manual. ※ Improve Health & Increases Balance:This crazy-fitness vibration machine will help you lose weight while increasing your body flexibility. It helps your body process fat 30 times faster than running. Simply use the machine for 10 minutes every day.It will not only promote blood circulation, fat loss and increase coordination, but it will also help with releasing backache as it decompresses the spine. ※ Relaxing At Home:4 suction cups affixes unit to floor for added stability and noise reduction,will not disturb you from watching TV shows, With two resistance bands, you can use the vibration plate in various positions to exercise all of your muscle groups.Perfect for enhancing metabolism, increasing bone mineral density, reduction of the stress elevation levels. ※ Ideal Workout:The reflex of contracting your muscles is the most basic, unconscious movement of any human being, starting at birth. All motor functions of the human body rely upon this innate movement, making it essential to work with. This vibration machine helps in maintaining these reflex reactions, thus burning calories and fat.